The Plug-in is far more than a Prius with a big battery, but does it offer sufficient real-world benefits over the cheaper, standard car? Or would you simply be better off with a BMW 330e? From a driving perspective, there are far better alternatives than the Prius Plug-in, including the similarly priced BMW 330e, but in many respects that’s missing the point. Only you know if the Plug-in will suit your lifestyle, and we have little doubt that for some it will tick a lot of boxes. It is undoubtedly an urban environment friendly motor, thanks to its considerable EV performance and extensive range. It’s also more tax efficient than the standard Prius, as well as being more refined and more comfortable. 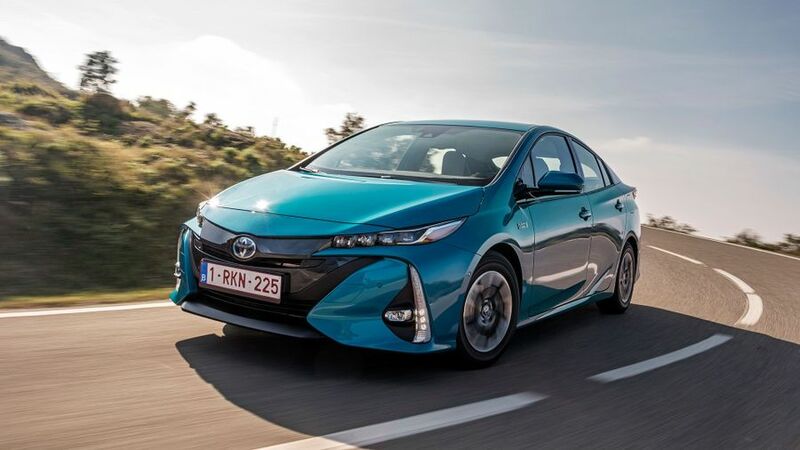 If your prime concern is the socially responsible image that goes hand-in-hand with Prius ownership, the standard car will do everything you need, cost considerably less to buy, and provide superior versatility and practicality. If you think the Plug-in is just a Prius with a bigger battery stuffed in the boot, and a charging socket slapped on its rump, then think again. 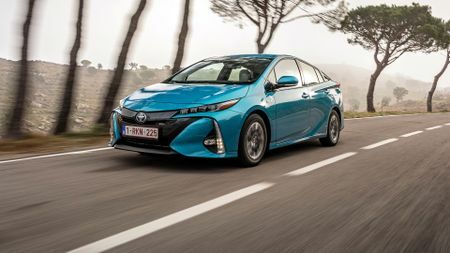 While the two Priuses may share the same familiarly wedged profile and curvaceous double bubble rear window, the Plug-in is actually 165mm longer, 20mm lower, and gains significant styling changes, including a completely new front end, replete with aerodynamic fins and four prism LED headlights, alongside vertical daytime running lights and indicators. 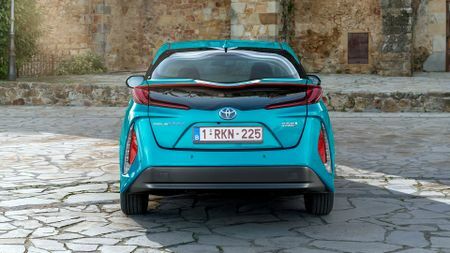 At the rear, an extra bumper bustle has been added to accommodate the bigger battery and retain crash integrity, while the boot spoiler is lowered and the rear light clusters have been moved outwards, which means the funky lightning-bolt rear clusters of the standard Prius have gone. 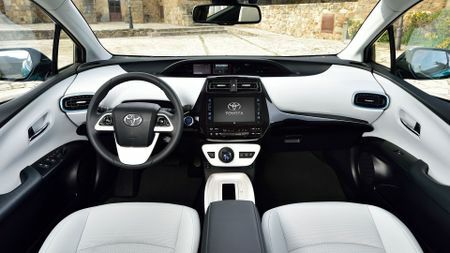 Inside, the dash, with its weird and wonderful kaleidoscope of displays and Darth Vader helmet shaped central infotainment screen will be familiar to any Prius owner. There are big differences when it comes to space and practicality, however, because the Plug-in loses the middle rear seat, and its boot is a good deal shallower than the standard Prius. So that’s it straight off the Uber list. 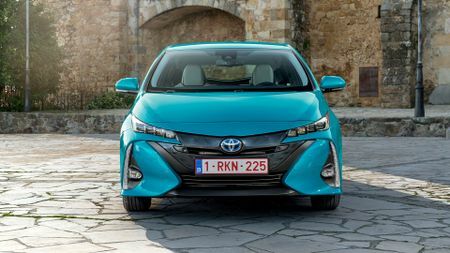 Once again, these changes are dictated by the battery’s larger dimensions, but it also helps keep the Prius’ fully laden weight down to manageable levels. The fact the Plug-in’s battery adds a huge chunk of weight explains why the rear hatch is made of lightweight plastic. To give you some idea of just how close to the wind the Plug-in sails in terms of weight management, if you specify the additional weighty £1,500 solar roof (which boost the car’s auxiliary battery), you can’t have heavy luxury items such as leather seats, and you also sacrifice some cameras and their related safety functions, such as blind spot monitoring. As well as having its near-silent running range boosted to a claimed 30 miles, the Plug-in now uses two electric motors to ramp up EV performance and can be driven at speeds up to 84mph, purely on electricity. What’s more, the latest electro-wizardry enables the lithium-ion battery to be fully charged from depletion in just two hours from a supercharger, or three hours from a domestic socket. From start-up and at lower speeds, the car will automatically run in EV mode, using electric power alone, but if you need some additional giddy-up, there’s also a power mode which delivers quicker throttle response and synergises power from the electric motor and the petrol engine to improve acceleration. Behind the dash lies a unique gas-filled climate control system, which will warm the cabin when there’s no heat available from the dormant petrol engine. That will be most of the time if you’re only commuting to the railway station. It’s also clever enough to work out how many people are in the car and supply heat to the requisite areas. There’s no word at the moment about controlling the cabin climate from your smartphone – in the same way you can pre-condition a Nissan Leaf when it’s plugged in – but you can bet Toyota won’t let its deadly rivals have any advantage for too long, so watch this space. Along with all the tech changes, Toyota has stuffed the Plug-in with loads of additional sound-proofing in an attempt to make it a more refined vehicle. In some respects, this is a welcome addition, as the standard car is prone to a fair bit of road-noise and the row from the engine when the automatic gearbox sends the revs soaring under heavy acceleration, is pretty raucous. There’s no doubting the Plug-in is a good deal quieter in both respects, and the fat walled tyres fitted to the dinky 15-inch wheels and suspension revisions certainly add a degree of plushness to the ride comfort. All well and good if you’re at your wits end with the rubbish surfaces that make up the vast majority of UK roads, but the penalty for this additional peace and suppleness is blatantly obvious the first time you come to a bend in the road. With a notable amount of body lean and an immense amount of squirming through the tyre side walls as you tug at the steering wheel in an attempt to get the nose of the Plug-in to change direction, you’re all too aware of the additional mass. The brakes are a bit of a laugh, too, with very little initial bite and a generally sluggish reaction, it’s all too easy to make a pigs-ear of it when trying to scrub off speed in a smooth, progressive manner. Of course, as with any hybrid, there’s the perennial elephant in the room when it comes to motorway use. Get the Plug-in galloping along at 70mph and once the battery power is spent, because of the additional weight, the petrol engine will start chewing through unleaded more voraciously than a traditional petrol car. Until we’ve experimented with the car running purely on petrol, it’s difficult to say with any certainty what that actual consumption will look like, but we’d bet our mortgages it’s nowhere as good as a decent diesel motor. 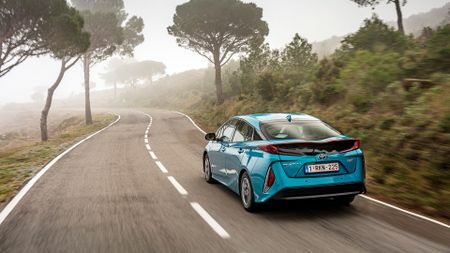 If you only use your Plug-in to commute short distances, it makes a lot of sense, but you’ll have to ask yourself if it is worth the significant premium over the standard Prius. It’s not as practical in terms of accommodation, the boot is significantly smaller, and if you’re a bit of a mile muncher, it won’t be any easier on petrol than the standard hybrid. There is also the similarly priced, superior driving BMW 330e to be considered, along with the excellent Hyundai Ioniq. At least you can have a bit of a chuckle at the taxman’s expense. With an official combined fuel economy of 283 mpg – no, that’s not a misprint – your company car tax bills will be levied at just 7 per cent of the Plug-in’s list price. Offering all the same image and most of the exhilarating driving abilities as the standard 3 Series, BMW’s hybrid is a classy, tax-efficient and significantly cleaner alternative to diesel-powered compact executive motors. As well as using a proper twin-clutch automatic gearbox, the Ioniq hybrid is better to drive than the Prius, has a plush interior, and is available with more kit than you can shake a stick at. Offering everything we love about the Golf with the added tax incentives and clean running capabilities of an EV. The limited range may still prove too restrictive for many, but if it fits your lifestyle, then it’s a compelling package.